So we took in our tomato plants this week. Now we've got a couple of big pots of soil on our porch that I'd like to condition for next spring. Gardening has proven to be an inexpensive way to get fresh vegetables, herbs and have fun cheap family activities, so we're going to do it again. Are you guys doing any kind of composting - and have you found a way to do it very frugally? Last edited by james.hendrickson; 10-17-2018, 07:14 AM. I think the very nature of composting is frugal -- you take natural waste, and turn it into healthy, new soil. We don't do it ourselves, but our neighbor has a 4’x4' box that he uses to make composte. Once a month or so, I'll add a bag of our lawn clippings to his composte box, and he's got alot of good soil now. We don't use it, but he does, and we're happy to help him with it. We don't, but I agree that composting is, by definition, a frugal endeavor. You're creating a way to reuse waste material that would otherwise be thrown out. What could be more frugal than that? We do worm compositing and regular compositing. I take all the leftovers and feed it mostly to worms. The rest into a bin in our yard from costco. Is it cost efficient since it cost money to buy? Nope but we like it. Last edited by james.hendrickson; 10-23-2018, 10:27 AM. Right now we'll probably just buy some worms. I put out a call on Facebook to see anyone had any, but most of my apartment dwelling friends don't have gardens. Also the brick and mortar options close by were actually about 40% less expensive. We compost. It is extremely frugal. Any time there are any vegetable scraps or spoiled food it goes into a pile in the corner of the garden. I turn it with a shovel on occasion to help with decomposition. One word of advice; don't put any meat or animal products in the compost pile. Keep it to plant matter only. Something about the animal fats not being good for plants. Is that really your composting bin? It looks awfully sterile with its peat moss and perlite potting soil. It is also too compacted. To get good bacterial action, you need enough volume to provide winter insulation, summer moderation of heat, retention of a moderate level of moisture. To get good work going on by the worms and insects that work cool compost bins/heaps, then you still need the same. Ideally you need contact with the earth. If you prefer a very small set up that has no contact with the earth, then I suggest you do bokashi composting, worm composting, or the tumble composting that Livingalmostlarge mentions. There is tons of info on the internet about these. I imagine some birds or mice will be along shortly to eat those fries. We use a service through our city. It allows us a wider variety to compost. We can compost paper, cardboard, even pizza boxes! It goes into a communal composting heap and I believe you can pick up compost for free in the spring. We inherited the bin years ago and I only used it for yard waste until recently. My goal is to only throw out one bag of trash per week and recycle or compost the rest. Joan, great points regarding needing more air in the soil. I've been periodically turning the dirt and adding our vegetable kitchen waste. At the start of the winter, we added a bunch of worms and I added some light fertilizer. 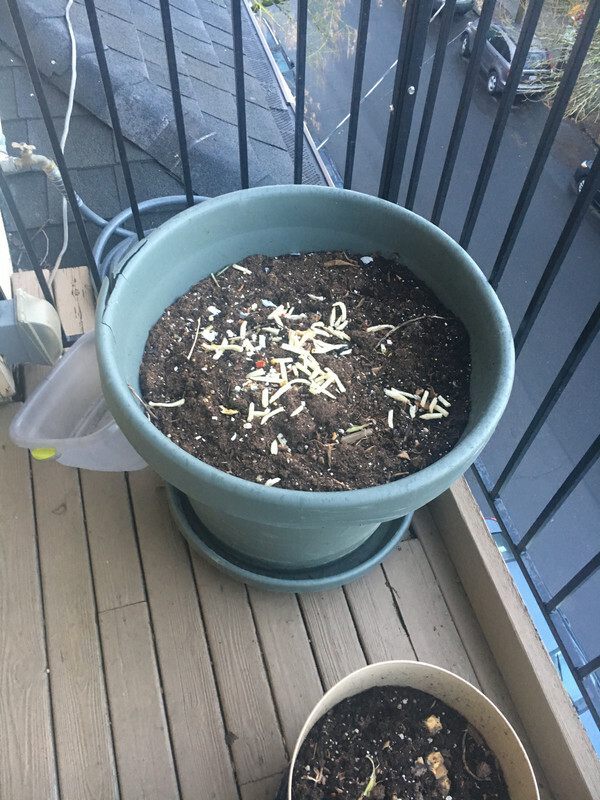 We live in an apartment and don't have a yard, per say, so we're pretty much limited to container gardening/composting. I can't wait to get the garden planted this year. We have plans for expansion and to grow some new and different things. Something about the animal fats not being good for plants. I honestly have no idea. That said, I would thing the dead vegetation is due to the bacteria that arises to decompose the corpse as opposed to the presence of the corpse itself. That's probably what kills the surrounding plant life. But I'm just speculating here.